Here it is – as I promised – my son’s wedding! From June! I know, I know! Where have I been? (See previous post). 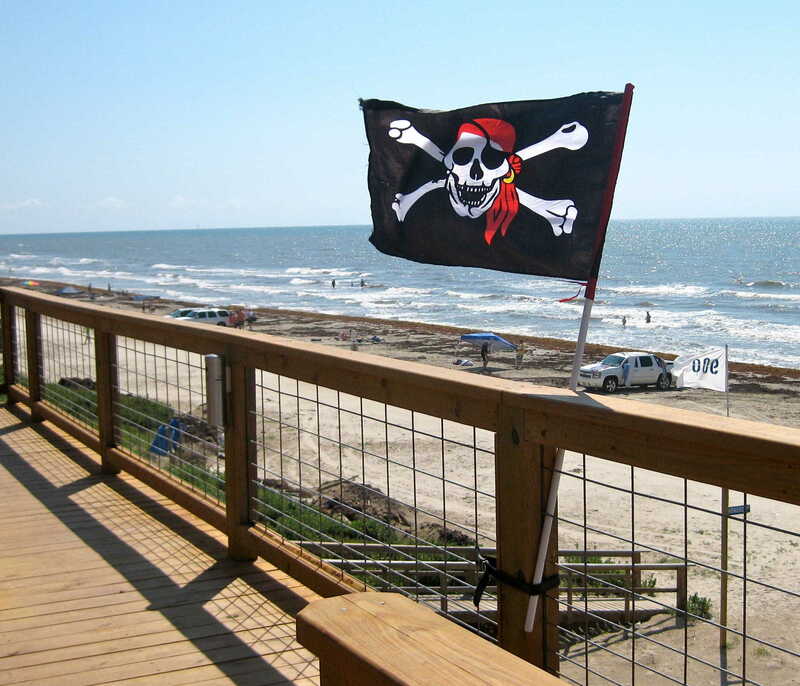 To catch up, you might want to read or reread my post of the day before the wedding – Get Me To The Beach On Time. 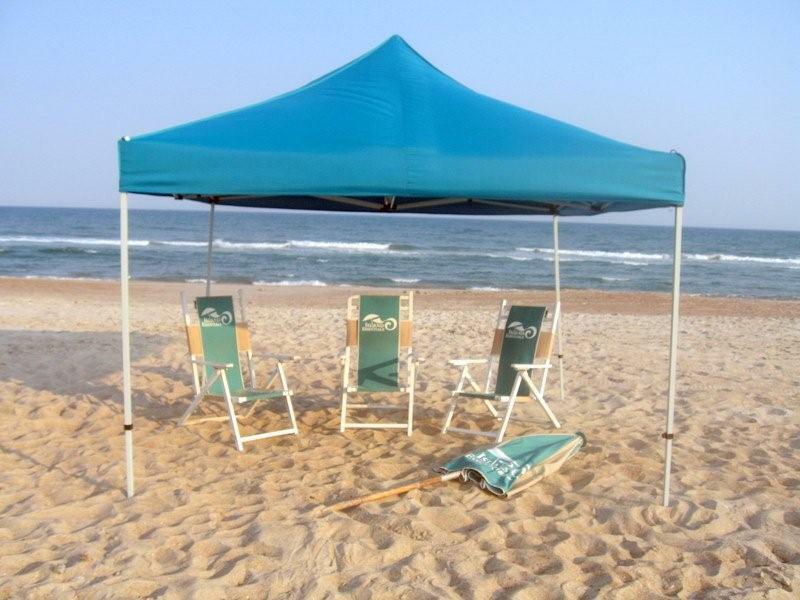 There was a rainstorm during the night which blew down our tent on the beach and our volleyball net. But no problem, we salvaged the net, we’ll get a new tent and they all had to come down for the wedding anyway. 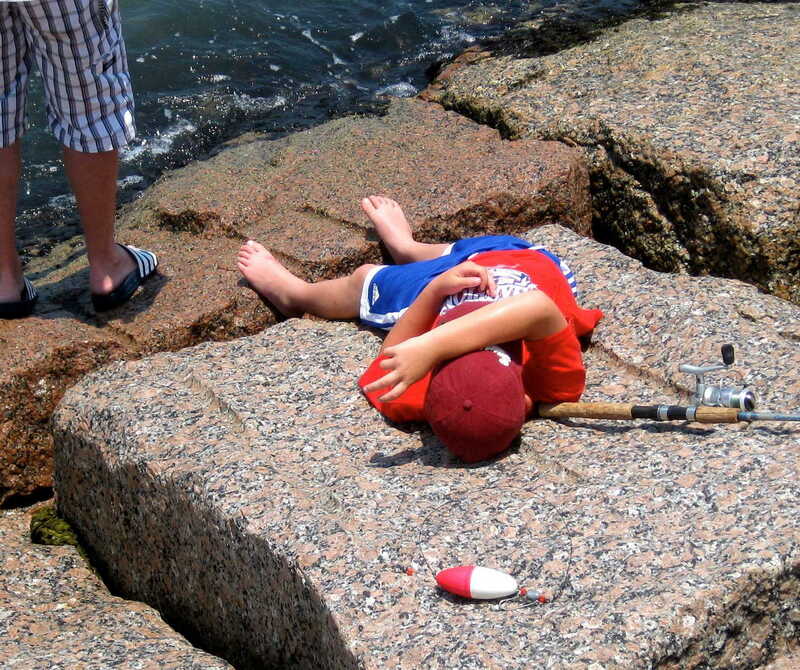 Next came the “raking of the beach”. 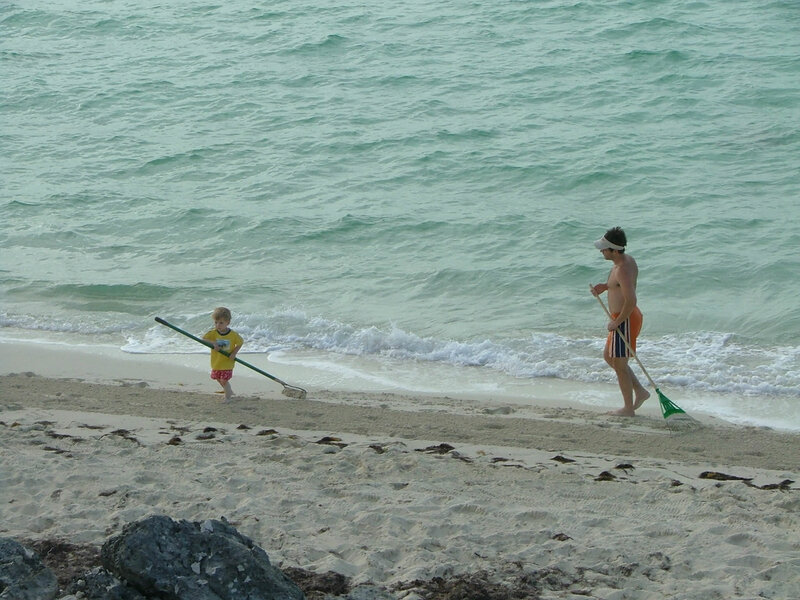 All hands on deck with rakes to remove seaweed, debris, etc. from the designated area. Special permission was needed because the seaweed is where the turtles breed and it happened to be breeding season. Talk about love being in the air! By this time the kids were eager for beach play and fun with the “beach” cart (actually a golf cart). So parents and tykes went off to create memories, while New Sweetie, Grandma J and I found a wonderful friend to arrange florals for the ceremony. We “helped” her – mostly by staying out of her way! I’ve never seen sunflowers look so beautiful in my life! The afternoon for us was spent setting up the reception area. 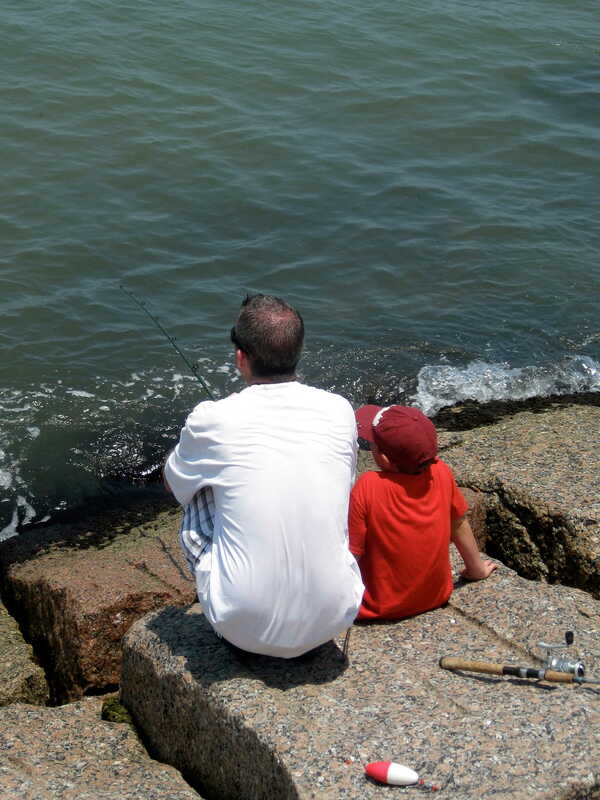 The guys and children went fishing off the the bank. I’m positive they all had much more fun than we did! Well, maybe not ALL of them! 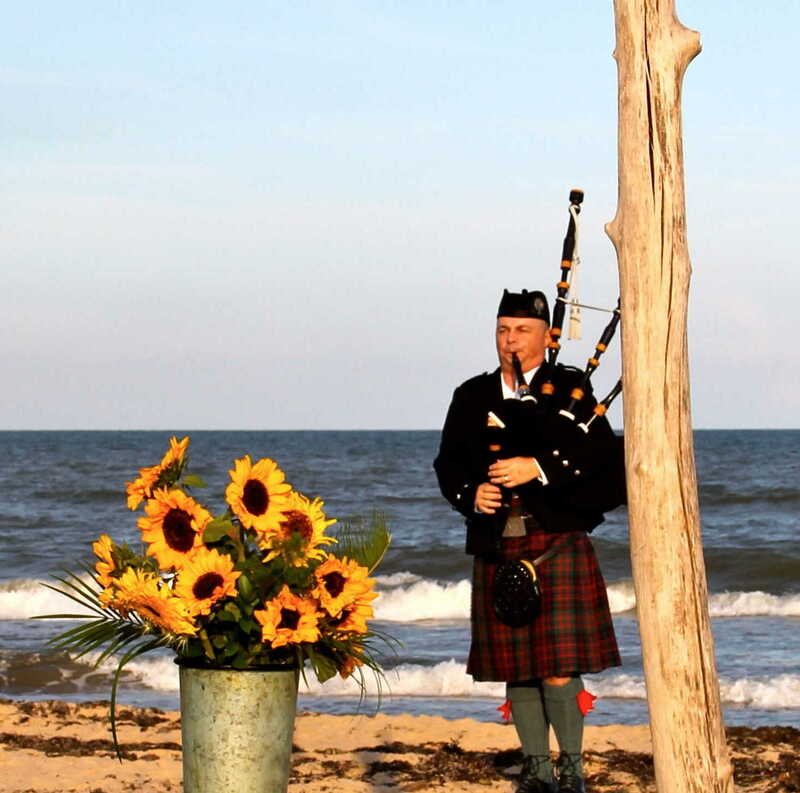 The hour of sunset approached, the chairs were set in place, the bagpiper began his soulful music and the ceremony was called to order. The ocean was perfectly calm, blue and a crisp contrast to the tan, clean sandy beach. All friends and family eagerly awaited the special event. A tall thin man stood at the front with a huge smile and bright eager eyes. 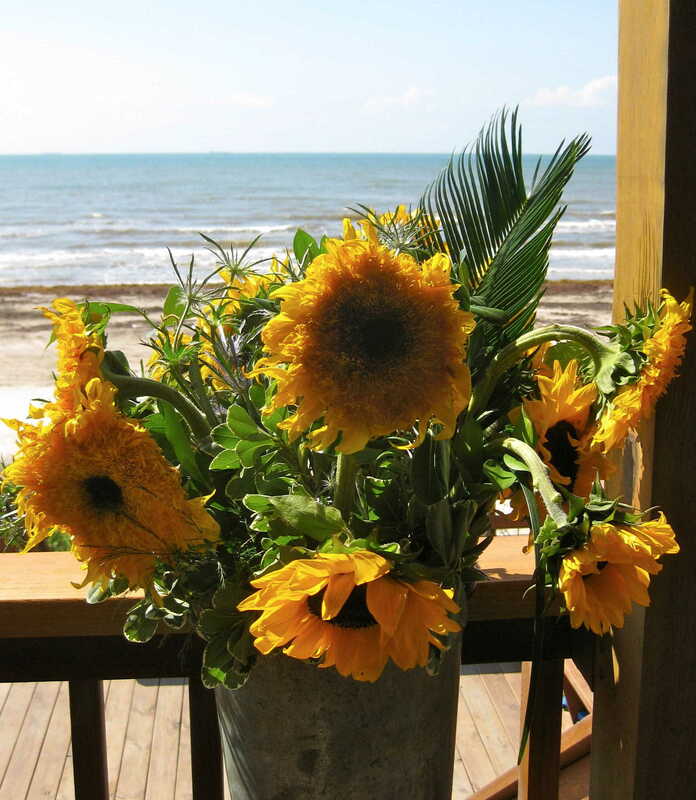 A moment later, two small boys on either side of a beautiful lithe woman carrying sunflowers in her hands and in her hair, walked up the aisle as one. 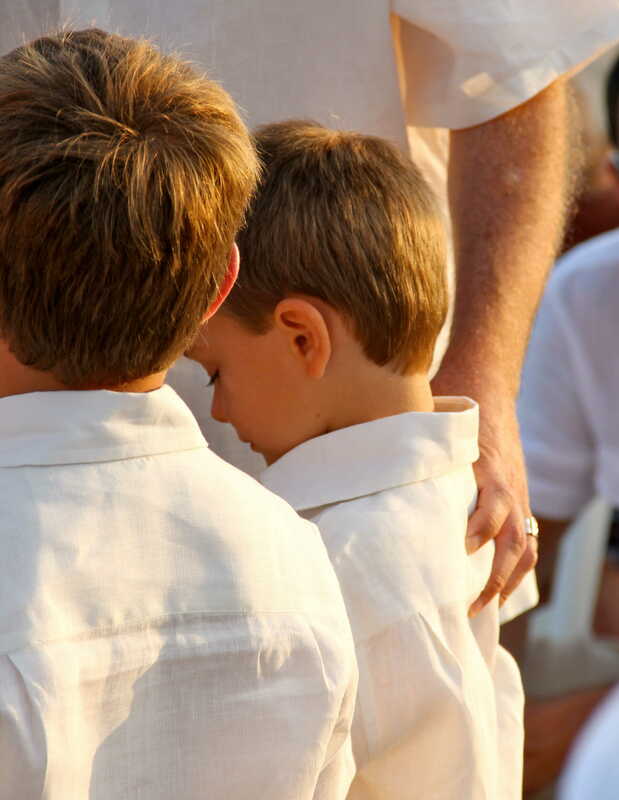 The smallest boy ran ahead to hug the man and when the party of four, man, woman and two boys, stood together, we had the most glorious wedding ever. Vows were said and rings were exchanged. 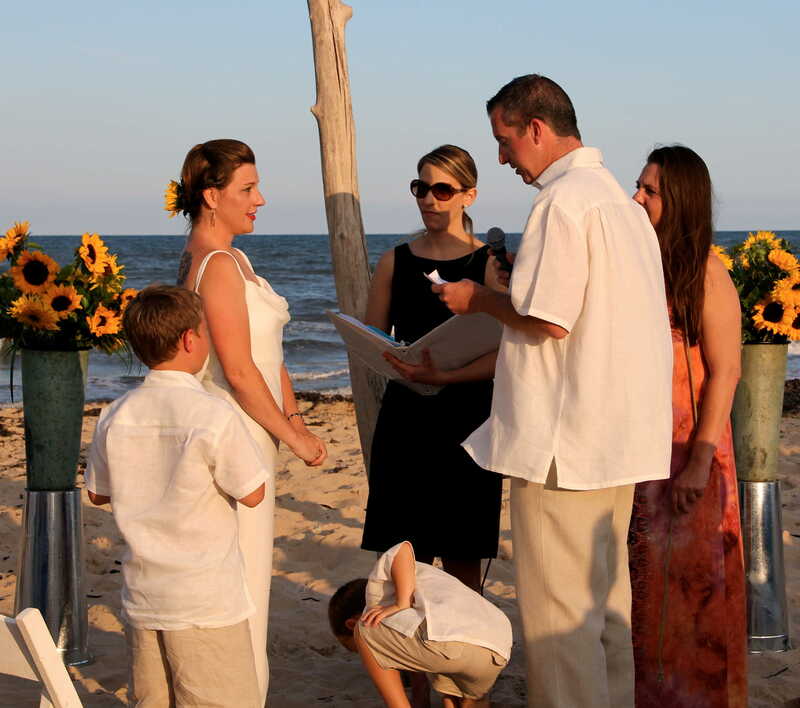 In fact, my wonderful son pledged his undying love and devotion to his new wife and his new sons. The spoken words were precious and memorable. “From this day forward you will be my wife and I will be your husband” and “from this day forward your will be my sons and will be your father”. All of us were in tears. And the wedding rings! Could they be any more special?! The bride’s and groom’s initials AND one for each boy. Because they were getting married too, you know. 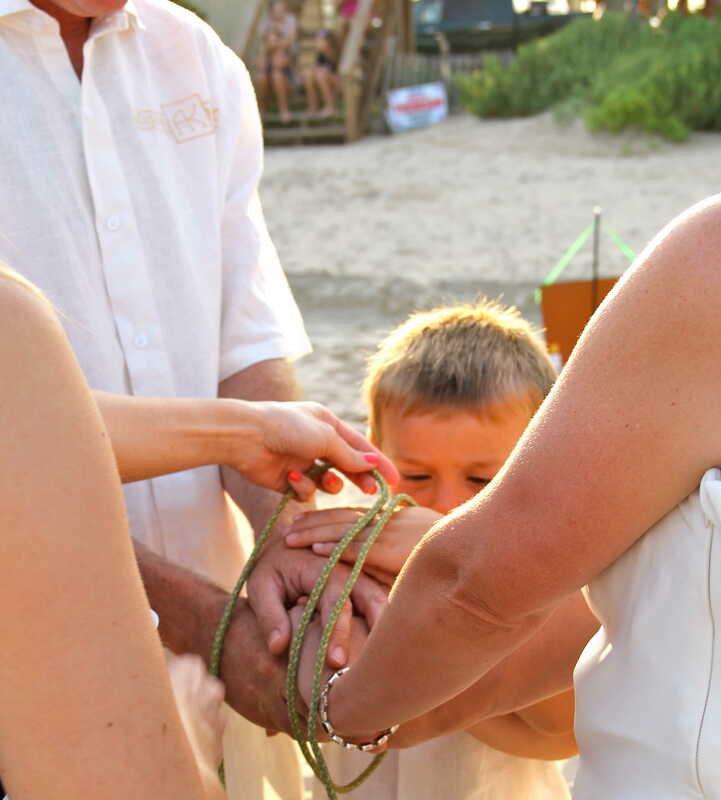 Continuing with the celtic theme, there was a binding ceremony, which symbolically united the new family and protected it from anything which would try to destroy it. Isn’t that the sweetest thing you have ever seen? I cried through the whole ceremony. Grandma J and I spoke, as the mothers of the bride and groom, to welcome the new family to our respective larger clans. 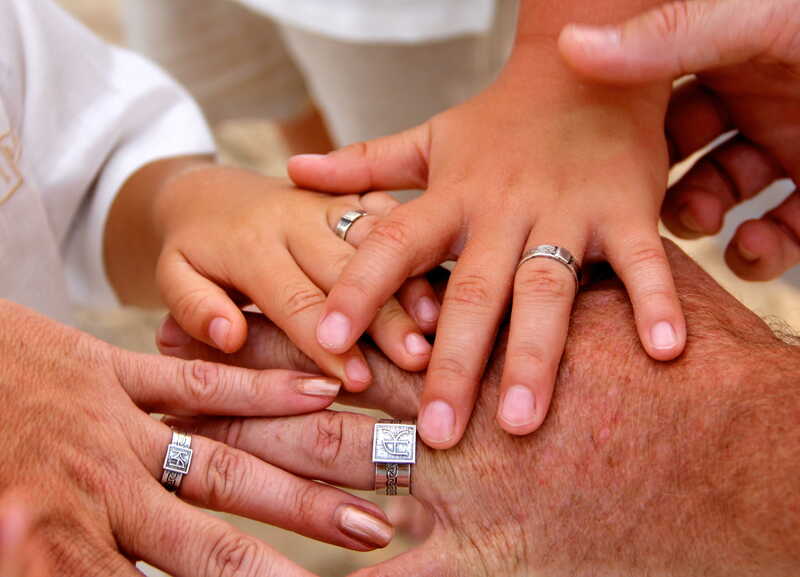 They had chosen to become a family that day and so also had chosen to become a member of each other’s larger family. They were all now a part of our group, our clan. Once you are a part of us, you are always a part of us. If you become lost, we will find you. If you need direction, we will show you the way. If you are sad, we will sit with you and hold you. If you are glad, we will rejoice with you and give thanks. Then the new brothers, sisters, aunts, uncles and cousins were introduced by name to our precious newly formed family. 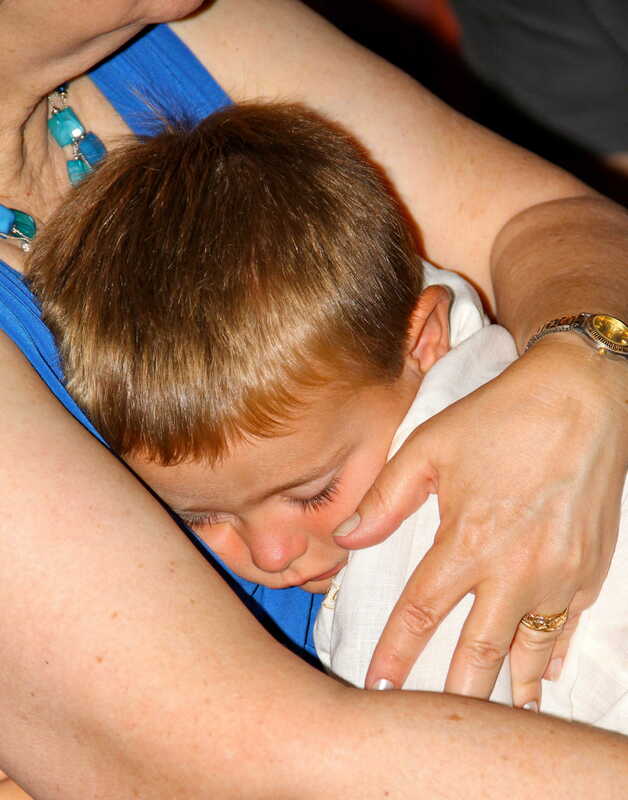 And no one was more excited than ALL the little cousins, who could not believe they were getting something out of this wedding. Two more cousins!! So okay, the little ones started to get antsy. 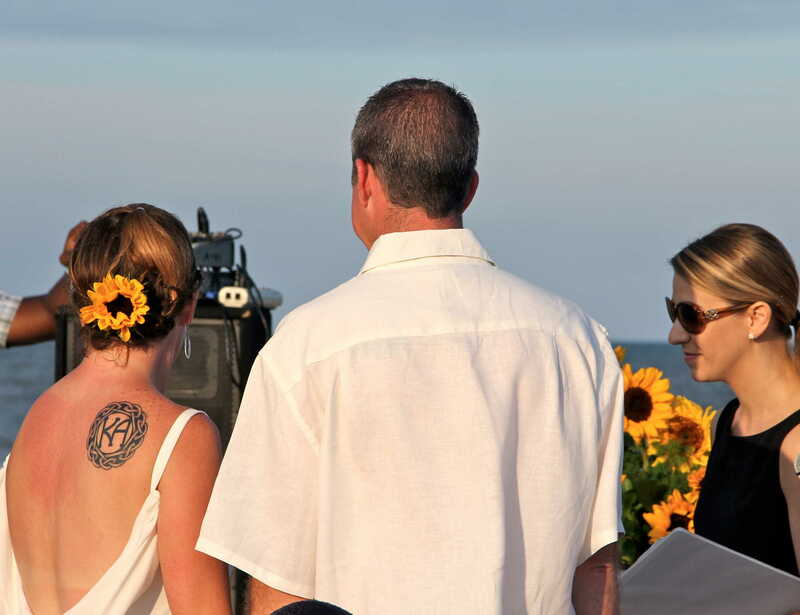 The ceremony was coming to a close and the sun was setting. Everything was as it should be. Time to get to the party!!!!! 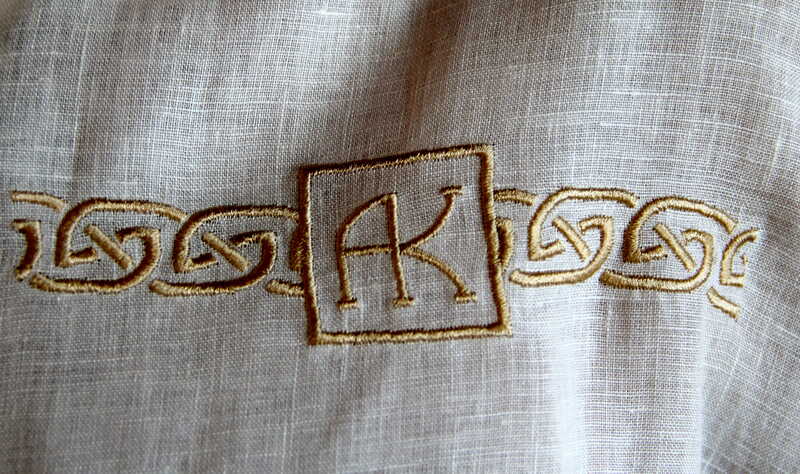 But first, may I show you the embroidery I did for the wedding ? My son designed this for all four rings. Brag! Brag! Then I developed the design to embroider it on the shirts for him and the boys, and for the back of New Sweetie’s gown. Love the celtic knot! 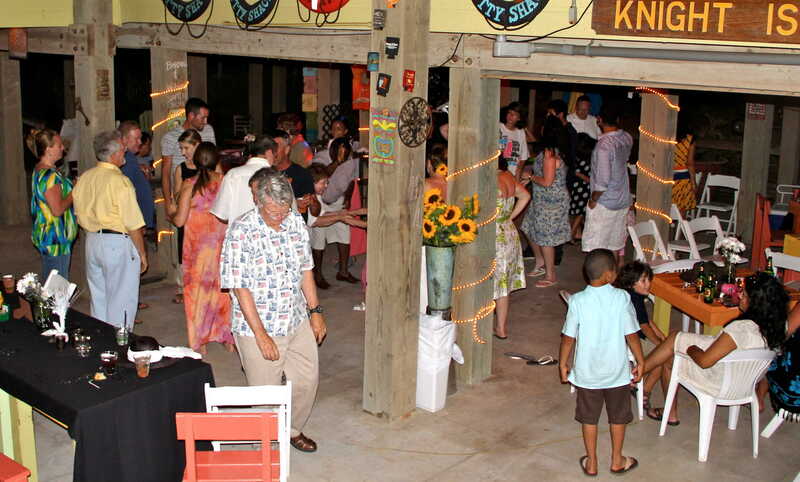 The reception was held just a few feet from the beach. Good food and Great DJ. Everyone danced, laughed, had a wonderful time, from babies to oldsters. 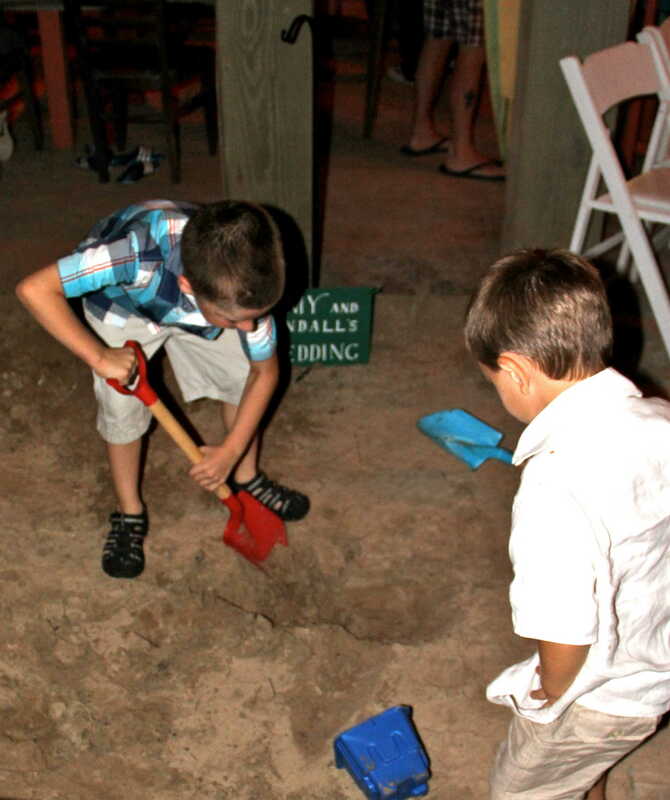 Some, of course, had their own ideas of what to do at a wedding reception – like DIG A HOLE! To each his own! Most of the attendees, however, chose to dance, chat and enjoy the delicious sweets. There were chocolate and vanilla cupcakes. 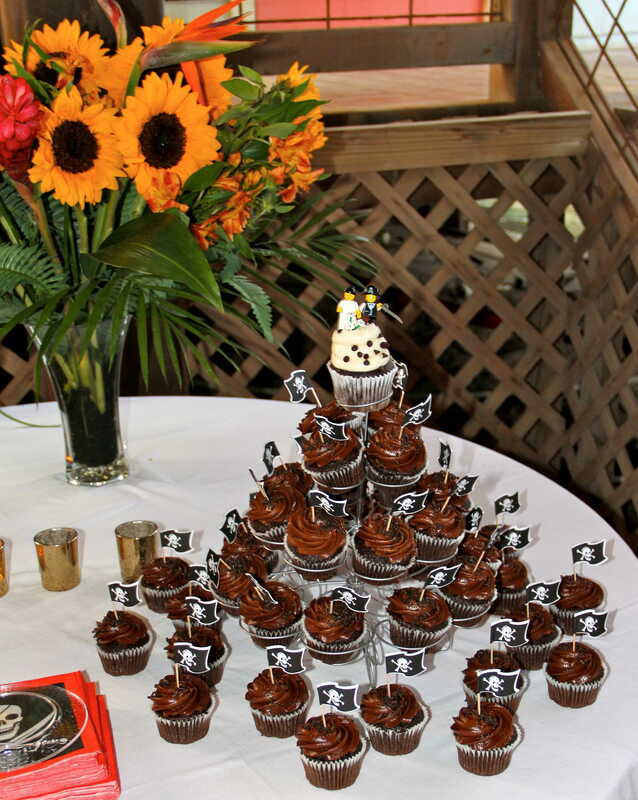 The chocolates had pirate flags (remember the celtic/pirate theme?) and were topped with the cutest LEGO pirate bride and groom ever. The kids went crazy! 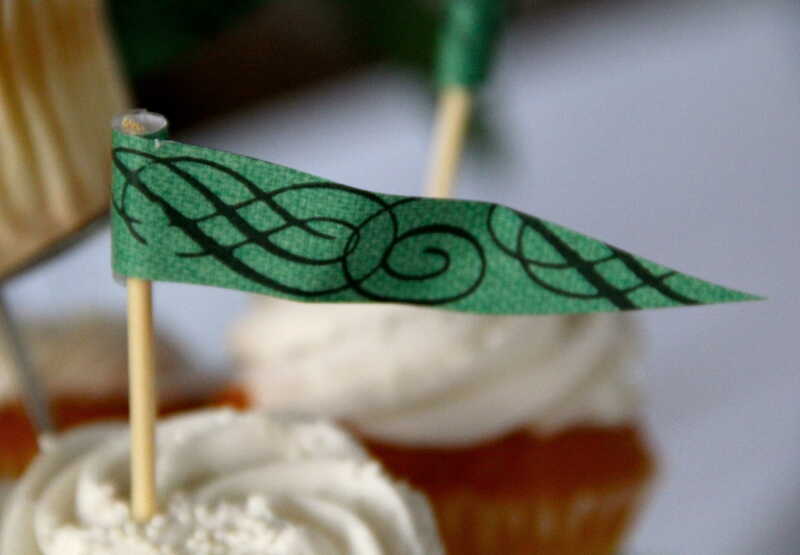 The vanillas were wearing celtic flags and were topped with the bride’s grandmother’s cake topper. Very sweet and sentimental. The perfect combination. Kids of all ages went crazy! 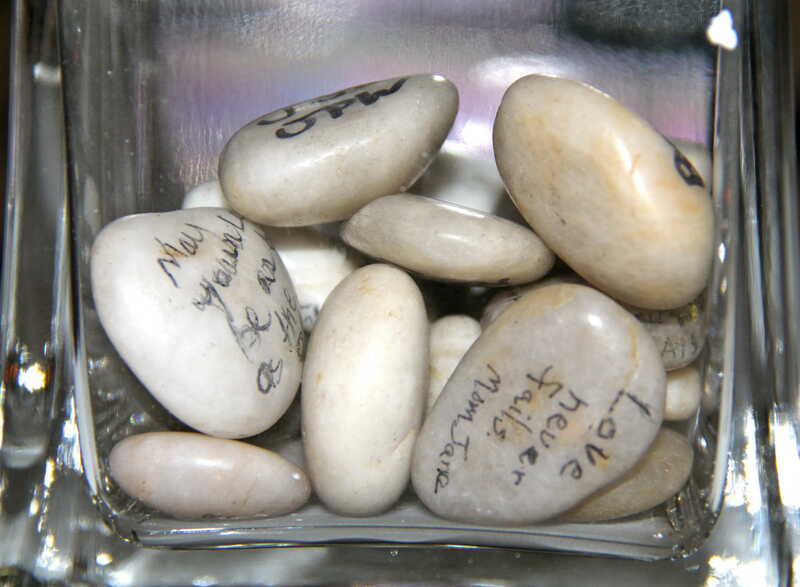 Instead of a sign-in book, the couple chose small stones for hand written notes. 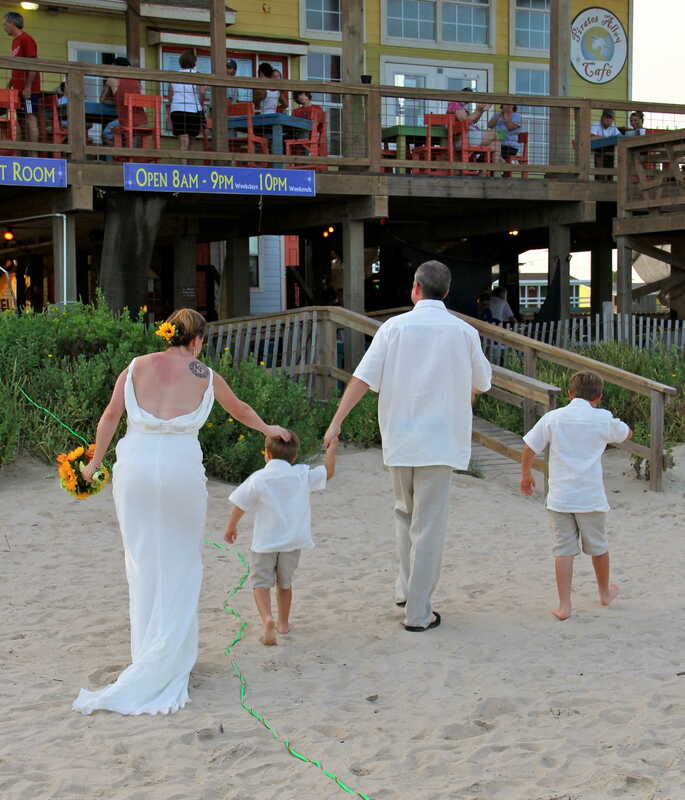 What a great memory of a beach wedding and what a great way to keep the love from one’s family close at hand! The partying went on into the night and early morn. We did the Bunny Hop, we did the Funky Chicken, we did the Macarena, we danced 50’s, 60’s, 80’s and 90’s. We danced as a group, as couples and alone. We did it all! We ate until we could eat no more. We had our fill of wine and beer. We even had a shot of Jeigermeister (yes, even me!). I’m telling you we did all there was to do! 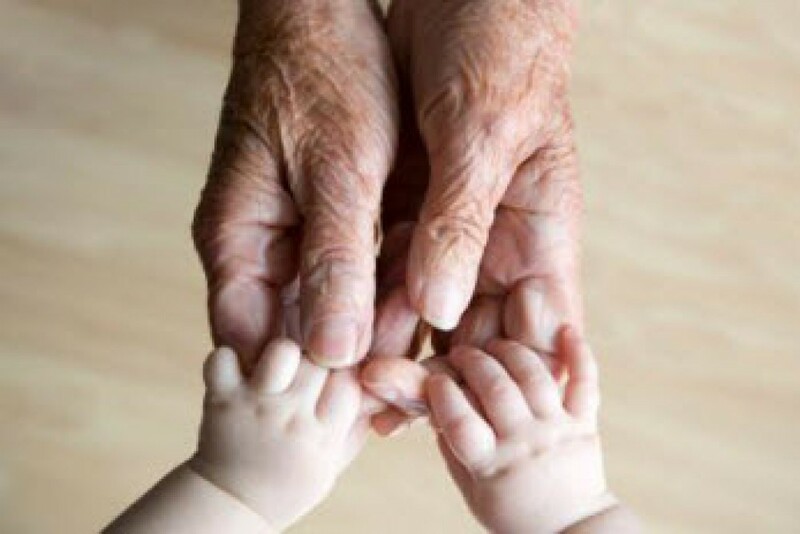 But eventually, all things must end and so slowly, one by one, people starting saying their goodbyes. Sleeping babies were taken to bed. Whining children were dragged off by equally whining parents. Until, alas, we all had to bid farewell to the happy couple. Adieu, my Sweeties. The next morning, not so bright nor early, Gramps was up making his famous Applesauce Pancakes for everyone on the porch of our room. The flag was waving, signaling food was ready. The family gathered to a lovely brunch of cinnamon rolls, pancakes, fruit, bacon and Sangria (for the adults) and a beautiful “next morning reminiscence” was had by all. Although some of us felt a little like the flowers, a bit droopy and spent, we had almost as much fun reliving the wedding day as we did experiencing it. The day was grand. The day was memorable. The day was perfect in every way. It was indeed the most beautiful gorgeous wonderful wedding you could possibly imagine. This entry was posted in In the Village and tagged beach wedding, children, family, food, friend, love, memories, reception, together by The Village Granny. Bookmark the permalink. What fun! Loved all the pics. Thanks for sharing the beautiful day with all of us! 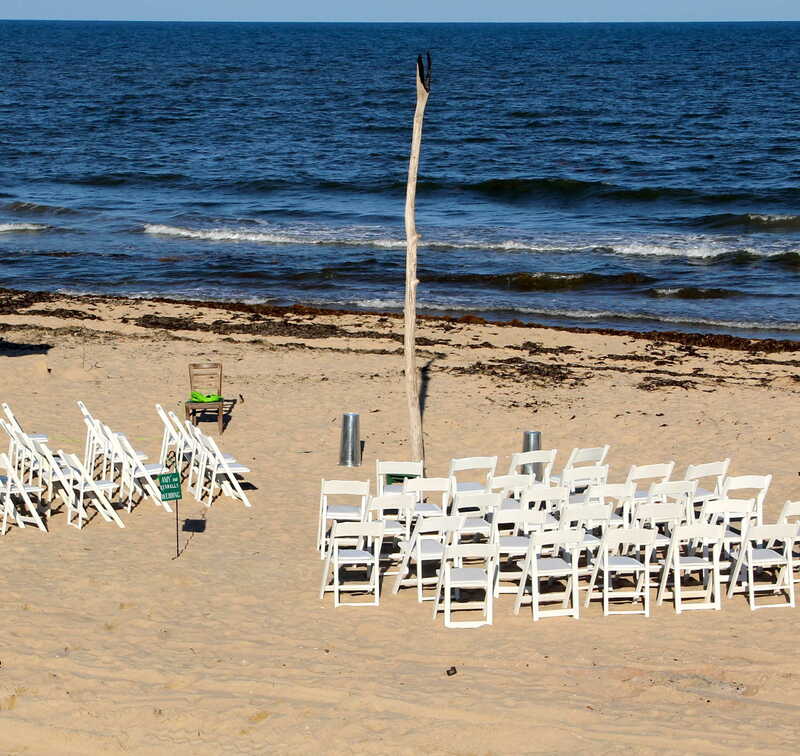 A perfect beach wedding….. Thanks. It was perfect! But I could be a bit biased . . . . . . or it was just a perfectly beautiful wedding! Yeah, I’m going with that! Beautiful photos…what a wonderful day! It was beautiful and wonderful! Thank you so much. Awe thanks. It was a perfect wedding! You are so welcome Sweetie! All for you! You are part of what made it so perfect! So beautiful. So wonderful. I love the rings. I love the dress and the embroidery. I love the Celtic knot, being Celtic myself. I cried a lot too. You are such a Sweetie! Thank you for the complement! And thank you for your hard-won wisdom too!